Getting there: From I-35 in south Austin, exit onto Slaughter Lane and head west. After a couple of turns in the road look for Yarsa Blvd. or Palace Parkway on the right. That's your key to prepare to turn left, immediately after some apartments that abut the park entrance. The parking area is quite a distance back, past the radio controlled plane airport. The large loop in the center of the park gets the most foot traffic. The Hike: Mary Moore Searight Metro Park off of Slaughter Lane never strays too far from civilization. The busy road to its north and I-35 provide enough road noise, though not excessively loud, to remind the hiker that one is not too far from the bustling city around it. The main loop through the park is popular for runners or walkers, further cutting into any desired solitude. Still, if you pick your spots carefully one can find some tranquil areas where its possible to leave the bustle behind. The trail begins at the waypoint "Trailhead", located near the physical center of the park adjacent to the main parking area. There are really two trail systems in the park, the "Metro" trail for runners, walkers and hikers, and the "Equestrian" trail for those on horseback. As you'll discover later, there's no sign of any equinne on the equestrian trail. Watch out for low flying aircraft near the northern trails. No, the park is not in a direct flightpath of Austin Bergstom. The park plays host to a radio controlled plane airfield. The high pitched whine of the planes' engines can be heard and at the very northernmost end of the trails can occasionally be seen overhead, though in actuality safely elevated. What the city calls the 'Equestrian Trail' provides some of the best trails in the park. Head south on the trail. You may find yourself on the equestrian trail without realizing it since both it and the Metro trail intermingle somewhat and cross paths often. Provided that you head south regardless of which path you choose you'll end up at the big loop. Like most of the Metro trail in the northern part of the park, the big loop is paved. Here there are some large open fields and the trail is wide open. Dog walkers and runners abound. The loop itself covers just over a mile. The terrain is a mix of open fields and Oak-Juniper woodlands. Expect a bit of shade and Sun. 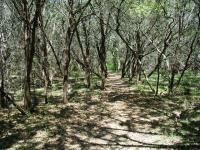 More interesting are the criss-crossed trails in the southwest corner of the park. You can use the big loop to get there and then get lost in a maze of small interconnecting trails. The trail here is packed dirt, with a little rock thrown in. You'll find far fewer people here and less noise and commotion. 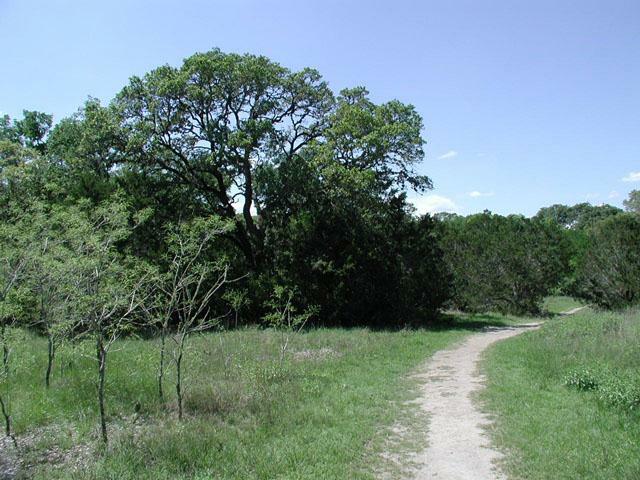 The other benefit of heading to the southern edge of the park is the trail's proximity to Slaughter Creek. At a couple of spots along the trail small overlooks perch over the stream below, a great place to relax. During the moments I spent along the creek I didn't see another person. Near the creek the vegetation gets a bit more lush and the air more humid. 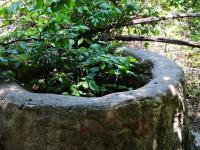 The trails near the creek are sometimes choked with vegetation and the air is heavier and humid. The generally humid conditions provided the proper conditions for something you don't see too widely in Central Texas, Spanish Moss. A large mass of it covered a large oak not too far from Slaughter Creek. An even less common sight was the moss draping from some of the nearby Juniper. 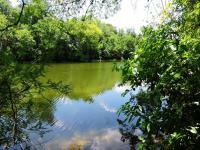 There are a couple of nice spots along the trail that provides views of Slaughter Creek. 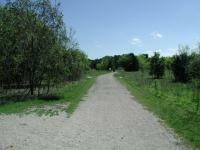 On the eastern edge of the park, and partly bisecting the big loop lies the equestrian trail. Hikers would enjoy these trails much more than the paved big loop and there appears to be no reason not to make use of it. During my visit I saw no horses and not even a sign of a horse having recently been there (manure or hoof prints). However, I did see several hikers along the trail. I suspect that the park has lost some attraction for horse lovers. 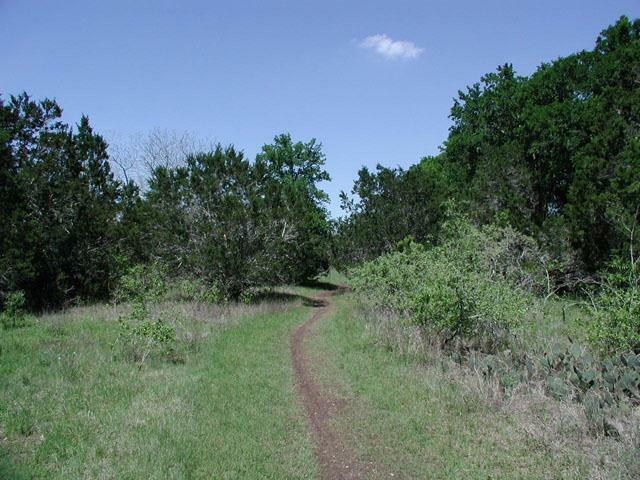 The trails out at McKinney Roughs provide more solitude and much more mileage. So while you may find no horses on the trail, you should always be ready if you do encounter one. Be sure to move to the side of the trail as much as possible and yield to horse and rider. 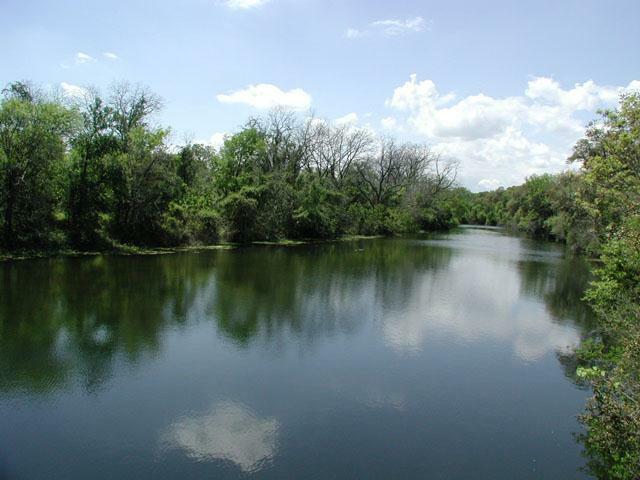 When one includes the equestrian trails into the equation, Mary Moore Searight Park ends up supplying almost 6 miles of trails. As you've seen, picking your trails and areas of the park greatly affect the solitude you can expect. This park is what you make of it. I had no idea this park was here, but it's certainly popular with the surrounding neighborhoods and apartment complexes, for whom it must be a very handy amenity. It feels a little decayed--some years ago, the park put in an extensive asphalt trail with periodic exercise stations, but now the surface is rutted and full of potholes, and for some reason all the trail maps have been removed. It's certainly not neglected, though, as the trails are fairly busy with a mix of walkers, joggers, and dog-owners, and cyclists, plus there is a model airplane park that seems to get heavy traffic on the weekends. Not a great choice for solitude, but it is a good choice for safety-conscious singletons, at least on a fine Saturday afternoon in spring. 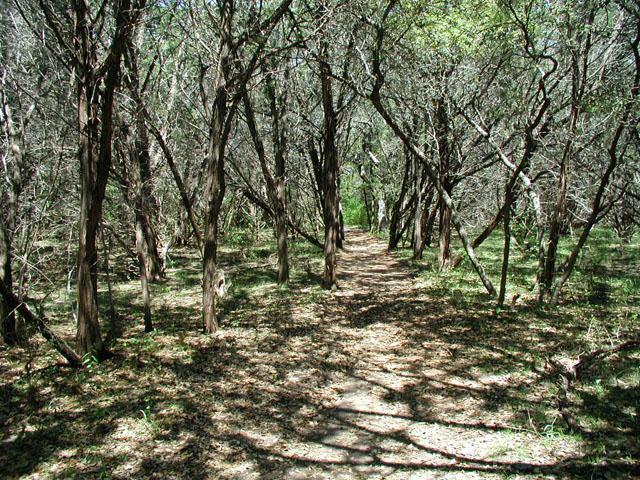 Like most parks in Texas, it could use more trees, but it does have some nice wooded areas (maybe 1/3 of the trail is shaded?). In addition to the asphalt trail, there are also unpaved trails that wander off into the woods, which are a little less walk-y and more hike-y, but on the whole, this is a pretty strollable, non-strenuous trail. Did a volksmarching event with lots of other people. It was great. Trails were well marked for us. We didn't get lost. Nice overlook of Slaughter Creek. The difficulty rating is higher if you do the excersise points throughout the trail. Flat terrain and the trails can be slightly confusing. 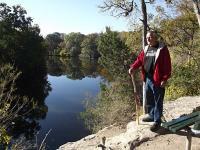 Joggers and disc golfers enjoy. my friend and i got lost....very very lost. :( ended up in a neighborhood and walked out to slaughter. why isn't anything marked?! This wasn't in my 60 hikes book but turned out to be a pleasant surprise. Easy to get lost here as we wound up going out of the park on the SE and winding up on a city street. Trees, a nice creek that is crossable on the dam. I'd rate this a 3.5 if I could split the difference.